The current Poop Rating of the Mediabase Top 20 is (-30) overall which is 20 point decrease(!!) from January (the last time we did this chart), and the lowest score since we started doing these ratings. That ends the previous upward trend of the chart with an absolute nosedive in quality. Though it's true that winter singles usually have deeper subject matter while summer singles lean towards shallow, party-ready music, this is bad no matter how you look at it. The best song on the chart is far and away Blake Shelton's "I Lived It." 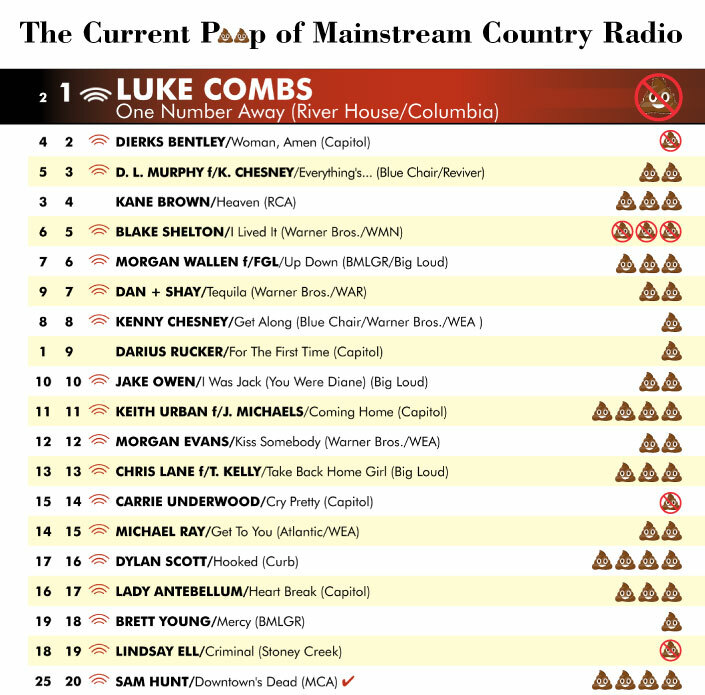 The worst is uh… I'll just pick one of the -4 rated songs at random… let's go with Sam Hunt's "Downtown's Dead." And yet again, there are only 2 solo female performers represented here. It's hard to be optimistic given this precipitous drop-off. Let's hope for better next time.